Trojan.Lockscreen is a malicious Trojan Horse that has entered your personal computer system without a warning. It is rather different from other Trojan infection because you are actually able to notice that you have been infected. To be true, the existence of this virus is really obvious and quite scary. Cyber criminals created Trojan.Lockscreen in order to collect money and personal information, so the level of threat this Trojan causes is high. If you have been attacked by this malicious virus, there is a possibility that your security tool is outdated or, even worse, non-existent. You will have to remove Trojan.Lockscreen from your computer as soon as possible in order to avoid the possibility of losing money or information. Keep reading the article to find out everything about the Trojan Horse. Why is Trojan.Lockscreen dangerous to my computer? So, the actions performed by Trojan.Lockscreen are malicious and threatening. The virus will display a huge warning message that will cover your entire screen. In this way, you won’t be able to access any of your programs or files anymore. It even blocks the Task Manager, which is often used by people when something is wrong with their computer. In other words, it will be almost impossible to do anything with your PC. 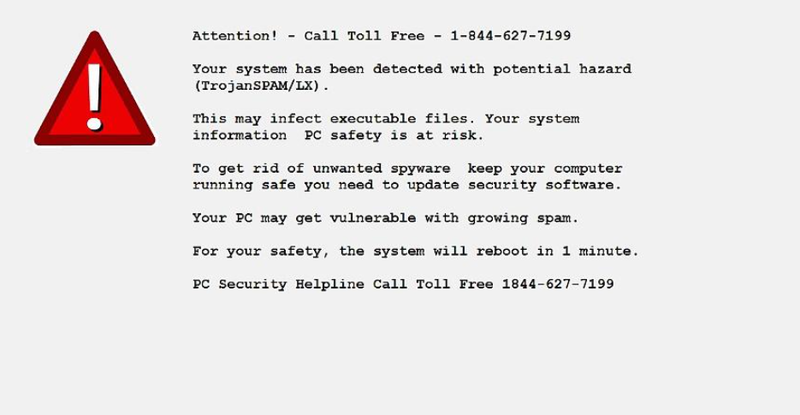 The message displayed says that “your system has been detected with potential hazard (TrojanSPAM/LX)”. This is actually untrue – you have been infected with Trojan.Lockscreen, not TrojanSPAM/LX. Consequently, you will be provided with a number that, according to the Trojan, should connect you to toll-free PC Security Helpline. This is untrue and you mustn’t dial it. Calling the number might end up in a huge telephone bill. In addition, your system will be restarted every two minutes to convince you that something is wrong. It is also very important to mention that this Trojan is related to the distribution of such malware as FBI Moneypak, FBI Green Dot Moneypak virus, IPA virus, etc., which belong to the family of Ukash and Police Virus. Additionally, it is partly responsible for spreading crypto-ransomwares like Cryptolocker, CTB Locker, and Cryptowall. Don’t wait for any longer and delete Trojan.Lockscreen now. How did I get Trojan.Lockscreen infection? There are many ways of infecting your personal computers with Trojan Horses and other cyber-threats. It is not advisable to click on any of the advertisements you find online because of this. In addition, pop-up windows and fake download buttons are really dangerous. Furthermore, it is against any recommendations to open spam e-mail attachments. They are created for sole purpose – to spread viruses and malware. Also, it is a must to have a good anti-malware application in order to uninstall Trojan.Lockscreen and other malware as soon as possible. How to remove Trojan.Lockscreen from my PC? Trojan.Lockscreen removal is impossible via Control Panel. You will have to open your Safe Mode with Networking. If you think that manual removal might be too difficult, don’t worry: you can do everything with a legitimate anti-spyware and anti-malware tool WiperSoft that you can acquire after opening your Windows with Safe Mode with Networking.